It is that time of the week again, Chargers fans. The team has released its weekly injury report. Some of the “usual suspects” find their names listed as out or questionable, but there is one new addition that is sure to change the way the defense runs its game plan on Sunday. That places 15 players on the injury report for Week 7. Free safety Eric Weddle will miss his first start since 2009. 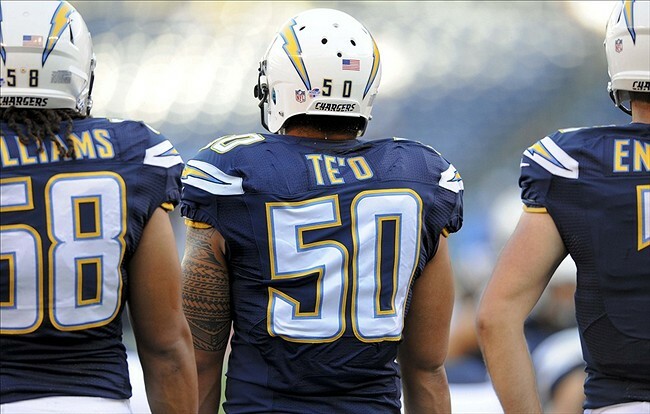 The three-time All-Pro is arguably the best player on the Chargers’ defense. It goes without saying that he will be missed, and his absence puts a lot of pressure on all of his fellow members of the secondary. With Te’o listed as doubtful, it appears that rookie Denzel Perryman will get his second-consecutive start. Last week in his first start of the season, Perryman led the defense with eight total tackles and a forced fumble. Due to the absences of Weddle and Te’o, it will be interesting to see which defender receives the green-dot helmet used as the defense’s communication device to the sideline with defensive coordinator John Pagano. In what I believe is the most disheartening news on the injury report, both Antonio Gates and Keenan Allen are listed as questionable. Having just come back from a four-game suspension, Gates has had back-to-back nine reception contests, adding two touchdowns. Allen has continued to shred opposing defenses, leading the league in receptions (53) while standing at third in receiving yards (601). Early reports are stating that Allen is likely to play despite his questionable status. Gates, however, does not appear to be in the same boat, as many fear that he may end up missing Sunday’s game against the hated Raiders. Sticking with weapons being at the disposal of quarterback Philip Rivers, wide receiver Stevie Johnson is in jeopardy of missing his third game in a row. That being said, after being a limited participant on both Wednesday and Thursday, he was a full-go in Friday’s practice. Prior to suffering a hamstring injury, Johnson was proving to be a reliable target for Rivers in the passing game. The offensive line appears to be getting left guard Orlando Franklin back this week. Though he was struggling a bit to get acclimated to the blocking schemes in San Diego, he will be a welcome addition to the starting lineup. Fluker, like Franklin, is listed as probable and he will be starting next to right tackle Joe Barksdale — the only opening-day starter to start every game this season. Rookie running back Melvin Gordon is making his first appearance on the 2015 injury report. He suffered an ankle injury during last week’s loss to the Packers. I feel his pride may be in worse shape than his ankle, as he fumbled twice, losing one, and was also denied a touchdown for the sixth consecutive game. All in all, the injury report has lengthened but it seems as though the team is getting healthier along the offensive line. The offense is still struggling to open up any semblance of a hole in the running game, but has done an impressive job of keeping Rivers clean in the passing game. Getting some starters back should help in both areas. The defense will be worth keeping an eye on this week, seeing as Weddle is out and Te’o will be joining him in street clothes come Sunday. This situation provides a great opportunity for some of the reserve defenders to come n and make their mark, showing they deserve more playing time. It is imperative that this team finds a way to get healthy as it enters the more favorable part of their schedule. With the exception of Denver, not one team left on the docket has a winning record. Coach Mike McCoy and company have their work cut out for them. Now is the time for the coaching staff to prove that they are better than their 2-4 record shows. Due to the fact that the Chargers versus Pittsburgh game is on Monday night, the team did not have to release their Week 5 injury report until today. Although it looks a little better than it did last week, there are still some concerns on the offensive line and in the secondary. Obviously, as mentioned in the title, the offensive line is still banged up and expected to be without its starting left tackle (Dunlap) and starting left guard (Franklin). Though Watt is listed as questionable, his groin injury was initially thought to be pretty serious. If he does play, he could see time at right guard, depending on the health of Fluker, as reserve center Trevor Robinson has done a fine job in place of Watt. Fluker has been nursing an injured ankle for the better part of a month. He has gutted out some performances as of late, but one could wonder as to whether or not it would have been wise to rest him, allowing him to fully heal. After finishing the win over the Browns with only two available wide receivers, the Bolts are again looking at slim pickings at the wideout spot. Stevie Johnson will miss Monday’s game with a hamstring ailment. His numbers will be difficult to replace, especially considering that Rivers looked his way quite often. Dontrelle Inman, 25, will be pressed into action again, helping to pick up the slack for the missing Johnson, and possibly Floyd should he not be cleared to play due to a concussion suffered in the second quarter last week. It wouldn’t surprise me to see the team promote Javontee Herndon from the practice squad to the 53-man roster. Herndon could also help in the return game should Jacoby Jones not be able to go again. Speaking of Jones, he was a limited participant in practice for the second day in a row. The 2015 free-agent acquisition has not played in a game since injuring his ankle during the Week 1 victory over the Detroit Lions. If healthy, Jones would be a welcome addition at both kick returner and punt returner. The Chargers’ special teams unit is averaging just over 20 yards per kickoff return, while they have totaled a league-worst five punt return yards. To put it lightly, that is beyond pathetic. Three of the team’s four starters in the secondary are listed as questionable. Flowers, Verrett and Addae being hurt leaves only Eric Weddle as a starter that is guaranteed to play on Monday. In the last two weeks, first Flowers in Week 3 and then Verrett in Week 4, the team’s cornerbacks came into the week listed as probable, yet, neither ended up playing in those respective weeks. Verrett was on the club’s 46-man active roster last week, but he did not even suit up, as he was in street clothes for the game. Flowers left last week’s contest with a concussion. It goes without saying that the Bolts would be far better off if they had both Flowers and Verrett healthy and in the starting lineup. It is going to be interesting to see if the extra day off helps ensure they get back into game action. Nickel corner Patrick Robinson has done a solid job filling in for the injured starters, proving that he was a great pickup in free agency this offseason. One can only wonder how the defensive backfield would perform if all four starters were healthy, but Robinson has made his share of impact plays during their absence. The Chargers may not be the most-injured NFL team, but it sure seems like it. The adversity they have had to overcome has already become a bit overwhelming. It is up to the coaching staff and the veteran players to keep this team focused, concentrating on improving and stacking up wins as the season progresses, regardless of who is out there on the field. Missing the playoffs again is not an option. The Chargers released their updated injury report on Chargers.com on Wednesday. Prior to breaking down what it means to the team, here’s the report. The initial timetable on Fluker’s return made it seem as though he would miss a serious amount of time; as much as six weeks. But reports have come out that his time on the sideline will not be as long as expected. This is great news seeing as Hairston had a miserable game against the Bengals, being beaten multiple times and drawing a couple of flags. Hairston, despite a knee ailment, was a full-go at practice as mentioned above. After watching the Chargers’ defense force Cincinnati to a punt due to a three-and-out on the game’s opening drive in Week 2, Keenan Allen muffed the punt, allowing the Bengals to recover inside the 20-yard line. Although Jacoby Jones hasn’t exactly been lighting the world on fire with his returns in the offseason and season opener, it would be great to have him back there, at least to secure the ball and get the Chargers’ offense on the field. Jones suffered an ankle injury against the Lions in Week 1. His return date has yet to be determined. On paper, it appeared that safety Jimmy Wilson filled in admirably for the injured Addae. I am not, by any means, going to sit here and say that he had a bad game, but it looked as though defensive coordinator John Pagano changed up his strategy in the secondary. Could this have been due to the fact that Addae was not available? It is hard to say, but I sure would like to see Addae back on the field making plays. Though he struggled against a stout Cincinnati defensive line, seeing that Watt is injured is troubling. The offensive line has already been banged up, and don’t get me started on the injury issues the hogs upfront faced in 2014. Watt is still learning his role as the team’s starting center. That being said, Mike McCoy and Frank Reich named him the starter for a reason. If for some reason Watt is unable to go this Sunday in Minnesota, reserve center Trevor Robinson is more than capable of stepping up and starting. As expected, both Johnnie Troutman and Tourek Williams were non-participants in today’s practice. Troutman should be inching closer to health as his diagnosis has him being available to return by about the fourth week of the season. Williams is still a wait-and-see type of scenario. The outside linebacking corps surely could use him. Finally, the news that tight end Ladarius Green showed up to Chargers Park with concussion-like symptoms is very alarming. If he does indeed have a concussion, this would be a third concussion-related report on Green since being blown up by former Patriots’ cornerback Brandon Browner last season in Week 14. Green laid on the field after taking the hit from Browner. The play drew a 15-yard penalty. With Antonio Gates continuing to serve his four-game suspension due to violating the league’s substance abuse policy, the fourth-year tight end is crucial in the success of the San Diego offense. He has already made his mark through two games, catching 10 passes for 121 yards and one touchdown. Green was shutout of the end zone in 2014. He is on pace for career highs in all receiving categories should he get back on the field. On a bright note, it is good to see that rookie outside linebacker Kyle Emanuel was a full participant today. He played a major role in the team’s win over the Lions in Week 1. Allowing him to rotate with Jerry Attaochu keeps him fresh and should enable him to continue to make an impact.